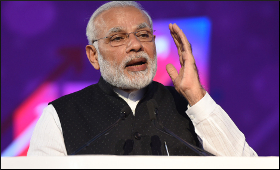 The Bhartiya Janata Party (BJP) unit in Tamil Nadu is all geared up for a public rally to be addressed by Prime Minister Narendra Modi in Tiruppur on Sunday, a party leader said on Saturday. This will be Modi's first visit to the state after the presentation of the interim budget for 2019. "After attending a government function, Modi will address a public rally which is expected to attract 150,000 people. He will address party members and others from seven Lok Sabha constituencies -- Ooty, Coimbatore, Pollachi, Erode, Karur, Tiruppur and Salem," S.K. Kharventhan, President, OBC Morcha in Tamil Nadu, told IANS. He said Finance Minister Piyush Goyal and Minister of State for Finance Pon Radhakrishnan would also be present. Before addressing the rally, Modi would launch several development projects at Perumanallur village in Tiruppur. Modi would lay foundation stone of 100-bed Employees' State Insurance Corporation (ESIC) health facility at Tiruppur that will cater to medical needs of over 100,000 workers and their family members in the hosiery town and nearby areas covered under the ESI Act. The Prime Minister would also lay foundation stones for a new integrated building at Trichy Airport and modernisation of Chennai airport. Modi would also dedicate to the nation, the 470-bed ESIC Hospital and the Bharat Petroleum Corporation Ltd's Ennore Coastal Terminal here. He would also inaugurate crude oil pipeline from Chennai Port to Chennai Petroleum Corporation Limited's (CPCL) Manali Refinery here. In addition, passenger service on the 10-km section of the Chennai Metro Rail -- AG-DMS Metro station to Washermenpet Metro station -- will also be inaugurated by Modi. The security has been beefed up in Tiruppur for Prime Minister Modi's visit.